Eurogrit BV is a major manufacturer and supplier of high quality blastcleaning abrasives for surface preparation of metal and stone surfaces. Eurogrit is a household name for contractors and users in the field of surface preparation for a wide range of industries including petrochemicals, marine and offshore construction and shipbuilding. Our advanced products are used for ship repair, tank coating work, on pipelines and tank farms, aluminium and stainless steel surfaces and for stone and concrete cleaning and renovations. 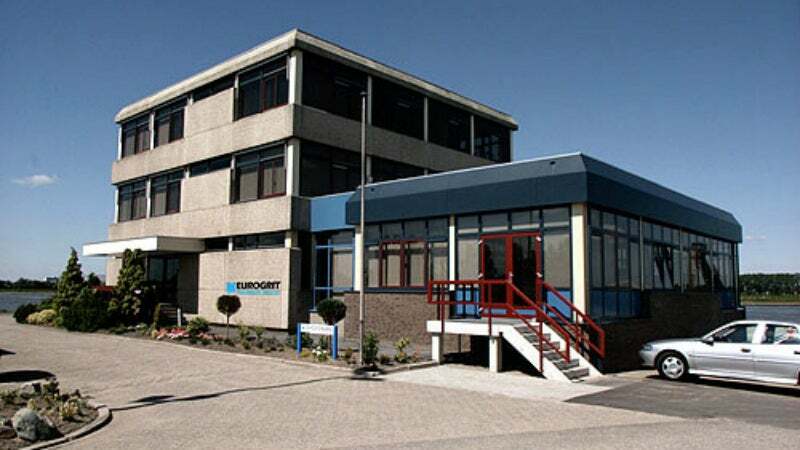 Eurogrit’s head office is located in Papendrecht, The Netherlands. The recently modernised and extended production facilities are operated at Dordrecht. A substantial part of Eurogrit’s business is export-related, with the company and its products represented in almost all parts of the world. The strategic location of the production facilities in Dordrecht, combined with extensive experience in transport and shipping ensure excellent export and shipping possibilities, for direct delivery to almost any destination in the world. Eurogrit’s product line comprises a range of expendable slag-based abrasives, as well as high quality recyclable abrasives and specialty abrasives for a wide variety of applications. Eurogrit operates under NEN EN ISO 9001: 2000 Quality System Certification, ensuring constant high quality. Eurogrit’s main product is the renowned expendable abrasive Eurogrit Aluminium Silicate (Coalslag). With a production capacity of over 150,000 metric tonnes, Eurogrit can ensure very short delivery times. Another important product in Eurogrit’s delivery program is Euroram Iron Silicate (Copperslag). Apart from these expendable abrasives, Eurogrit also supplies a range of recyclable and specialty abrasives such as garnet, olivine, chilled iron grit, steelgrit and steelshot, aluminium oxide, glassbeads, sintergrit and sintershot, sodium bicarbonate, calcium carbonate, softblast, dolomite etc. A well-known disadvantage of iron and steel is the fact that it rusts – one of the better-known forms of corrosion. In order to optimise the life of expensive installations and constructions and to create a higher return on investment, iron and steel are usually protected against corrosion by means of one or more layers of protective coating or similar products. Before applying such a protective coating, one must thoroughly prepare the surface to create the best possible adhesion between the surface and the coating. One of the most effective methods of surface preparation is abrasive blastcleaning. A proper preparation of the surface is essential. Even the best protective coating systems are never better than the quality of the preceding surface preparation. In most cases, premature failure of the protective coating system is caused by improper or sub-standard surface preparation. Therefore, Eurogrit BV is specialised in the production and supply of a complete range of high quality abrasives to ensure proper performance of expensive protective coating systems. Even today, people use the word ‘sandblasting’. However, in many cases this description is no longer correct. In the past, sand was used as an abrasive. In The Netherlands, however, the Silicosis Law was enacted in 1957, incorporating the so-called ‘Sandblasting Decree’. According to this law it was, from then on, forbidden to use material containing more than 1% free crystalline silica for blastcleaning. Eurogrit BV was one of the first to introduce alternative safe blastcleaning media and has in the meantime become a market leader in The Netherlands as well as abroad. The company Cornet Groep has received the order from Scheepswerf Bocxe Delft Shipyard to completely blastclean and coat the sail logger VL92 Balder. During the 1950s, Eurogrit was established in the Netherlands to introduce silica-free blastcleaning abrasives to replace sand. Eurogrit is a leading manufacturer and supplier of high-quality blastcleaning abrasives. For the past 30 years, Eurogrit has been part of the Sibelco Group. Sibelco is one of the largest mineral companies worldwide, with hundreds of production sites spread across 41 countries. In June 2011 the Gryphon A FPSO (floating production, storage and offloading unit) from A.P. Moller-Group in Copenhagen arrived at Damen Shipyards in Schiedam.